The Musicians Union of Ghana (Musiga), has honoured the Managing Director of Sunyani based Suncity FM, Mr Ransford Antwi, with a citation of honour. 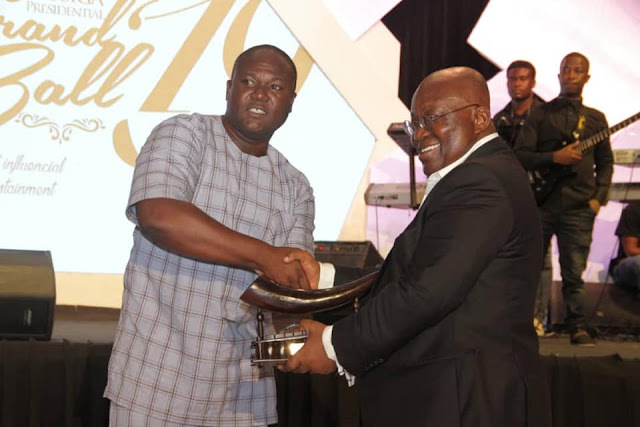 At its sixth MUSIGA Presidential Grand Ball at the Accra International Conference Centre on Sunday, 7th April 2019, Mr Ransford Antwi, who is the manager of legendary Ghanaian Musician, Kojo Antwi (the maestro) was given a citation of honour in recognition of his enormous contribution to the Ghanaian Music Industry. “This Citation is in honour of Ransford Antwi in recognition of your contribution to the development of the music industry in Ghana. As a pillar and great supporter of the music industry, your quest to create a vibrant music industry in the Bono and Ahafo regions saw you setting up a recording studio for upcoming artistes in the region to record free-of-charge,” part of the citation read. “Your continuous sacrifice, unwavering dedication and wisdom have been of immense benefit to numerous musicians, including the maestro, Kojo Antwi,” the citation stated. The sixth MUSIGA Presidential Grand Ball was organized in Accra on Sunday 7th April, 2019 at the Accra International Conference Centre. Among the distinguished dignitaries was the President of Ghana, His Excellency Nana Addo Danqua Akufo-Addo. Speaking at the event, the President of Ghana H.E Nana Addo Danquah Akuffo Addo promised MUSIGA of a new headquarters. The President also reiterated some initiatives by his government to develop creative arts in the country citing the passage of the Creative Arts Bill which will involve the establishment of a creative arts fund to assist in the work of creative arts practitioners. President of MUSIGA, Bice Osei Kuffour (Obour), on his part, called on corporate Ghana to continue supporting the Union in its efforts to improve a lot of ageing musicians in the country, which was his vision eight years ago when he sought to lead the Union.